First-year SUNY Oswego students cruise information tables as part of New Student Orientation. SUNY recently gave a Student Affairs Award to SUNY Oswego for a program to provide express buses from the New York City metro area to campus this year for two of the college's orientation sessions. OSWEGO — SUNY Oswego recently earned a State University-wide award for providing express shuttle service for incoming students from the New York City metro area to attend New Student Orientation sessions at the college this summer. First-year SUNY Oswego students cruise information tables as part of New Student Orientation. SUNY recently gave a Student Affairs Award to SUNY Oswego for a program to provide express buses from the New York City metro area to campus this year for two of the college’s orientation sessions. SUNY Oswego’s Jerri Howland, vice president of student affairs and enrollment management (interim) and dean of students, said this award is gratifying. The college has invested in full-time admissions counselors in metro New York and on Long Island, as well as part-time recruiters in the Lower Hudson Valley and New Jersey. For years, SUNY Oswego has provided such bus service for weekend Admitted Student Days on campus. The express bus service — providing New York City-area students and their guests with a choice of two dates for orientation — combined the efforts of Howland’s office and those of Admissions, New Student Orientation and Auxiliary Services, which assisted in keeping the cost low. Emmanuel Cruz, regional admissions counselor in New York City, rode the bus both ways each time, to provide additional support and information to the new students and their guests. Alyssa Steele, coordinator of New Student Orientation at Oswego, reported that surveys of more than 100 riders showed 99 percent agreed the Orientation Express Bus was convenient, 74 percent agreed the cost ($90 per person) was reasonable and well over 90 percent found the accompanying staff member helpful and riders connected with at least one other person who rode the bus. “‘Overall, I believe that this experience was great and I would definitely recommend it,'” Steele quoted from one of the surveys. 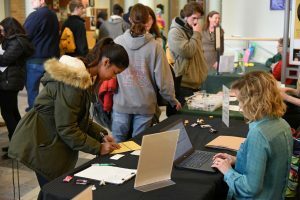 The mission of New Student Orientation at SUNY Oswego is to provide programs and services that ensure a successful transition to the academic, cultural and co-curricular environment at the college. For more information, visit oswego.edu/orientation.